Availability: This product is discontinued and no longer available for purchase. For alternatives browse our Racketball Bags department. The Wilson Advantage II is a stylish 3 racket bag with 1 main compartment and a front zipped pocket perfect for the accessories. It features a carry handle and a padded shoulder strap to ensure comfortable transportation. Bought this for my son who plays on the weekends. Fits all his rackets in nice and secure and keeps them all together so he doesn't lose them! Cheaper than his old bag but still looks and feels quality and has the added advantage of being a backpack. He's happy, so I'm happy - money well spent. We bought our son a few rackets for his birthday and we needed a bag for him so got this as well. It all came on time and so far we have no complaints! First time we had used sweatband and we're impressed with the service. Keep up the good work! 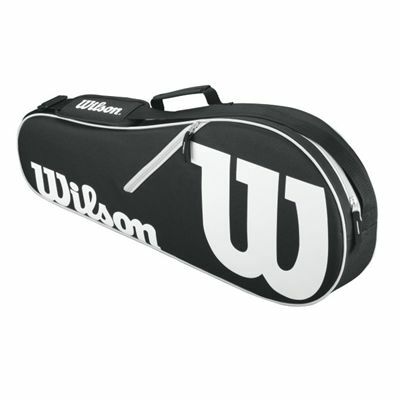 for submitting product review about Wilson Advantage II 3 Racket Bag.